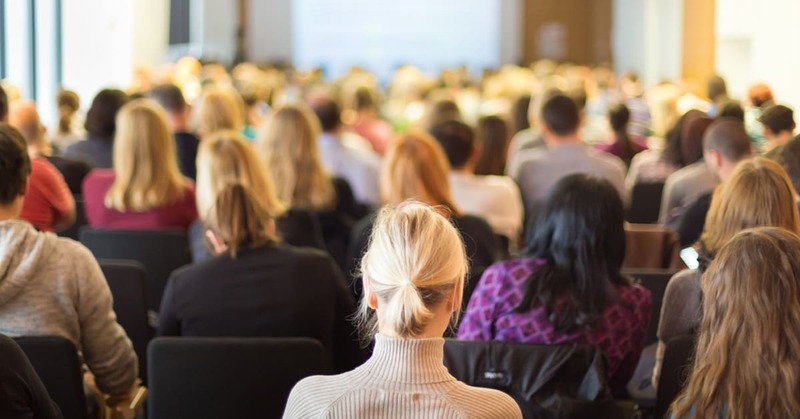 Conferences have long ago stopped being the main way to gain access to the latest ideas, tools, and practices in various industries. However, they are still incredibly popular in terms of networking and recording own (and the other market player’s) presentations to use as supporting materials in daily work, and the source of inspiration for the new projects. Below is the list of 10 most notable upcoming DevOps conferences for 2018. DevOpsDays is the continuous event that takes place in multiple cities worldwide on multiple dates along the year. Everybody interested in advancing their understanding of the DevOps culture, best practices, recommended workflows and top-notch tools can attend this event to communicate with prominent experts, visionaries, and practitioners from the industry-leading companies and local businesses. TheContinuousLifecycle.London Conference will be held from 16 to 18 of May 2018 in London. The keynote speakers will include experts from multiple companies worldwide, like Linda Rising from ASU or Alexis Richardson from CNCF, who will share their real-life experiences in transition to DevOps and adoption of various DevOps practices, workflows, and tools. Continuous delivery and other DevOps related topics will be interesting for CTO’s, DevOps specialists and QA engineers. If you live across the Atlantic, you might be more interested in going to GlueCon event, which will take place in Broomfield, CO, USA from 16 to 17 of May 2018. This event is devoted to exploring the impact of the latest technological advancements like serverless computing, microservices, Docker containers and cloud-agnostic APIs, system performance monitoring tools, Blockchain applications in DevOps and a variety of other topics. There will be more than 50 speakers, with keynotes from Google, Microsoft, Twitter and Pinterest, VMware and RedHat. DevOps West Conference from Techwell is taking place at Caesars Palace in Las Vegas, NV from 3 to 9 June 2018. Sponsored by innovators like Delphix, Atlassian, Parasoft, and Tap.QA, this event boasts speakers from Microsoft, eBay, and Thoughtworks, among others. Devoted to continuous innovation of software delivery cycle, this annual conference gathers a passionate community of speakers and experts from various countries across the globe. O’Reilly Velocity is the conference heavily packed with workshops aimed at teaching IT specialists to build highly available, resilient, and well-performing distributed websites, apps, and systems. The event will take place at San Jose from 11 to 14 of June 2018. The keynotes and speakers come from Google, Microsoft, Verizon, Salesforce, and Akamai, as well as multiple companies worldwide. DevOps Enterprise Summit is the event planned to occur in London from the 25 to 26th of June, 2018. Located at Intercontinental London – The O2, this biggest European DevOps conference will gather more than 500 attendees, more than 40 speakers from the leading IT businesses and 23 sponsors across the EU, around 40 sessions packed with useful information. The list of partners, keynotes and speakers includes Automic, GitHub, New Relic, Chef, XebiaLabs, Atlassian and many more. SREcon Germany takes place in Dusseldorf, Germany from 29 to 31 August 2018. With Usenix being the main sponsor and host, this conference is aimed at gathering the DevOps and software development experts and practitioners to exchange ideas and experiences on further advancing the technological landscape for European, Middle Eastern and African companies. The keynotes include speakers from Google, Microsoft, LinkedIn, Udemy, Facebook, IBM, DigitalOcean and other industry leaders. DevOps Summit West will happen at Santa Clara Convention Center, California from 6th to 8th of November, 2018. This event gathers the influencers, thought leaders and bright practitioners from all DevOps-related branches of IT industry with keynote speakers from the companies like Google Cloud, Datera, Codigm, and Akvelon. As one of the year’s closing events, this summit will wrap up the latest DevOps tools, practices and breakthroughs of 2018. 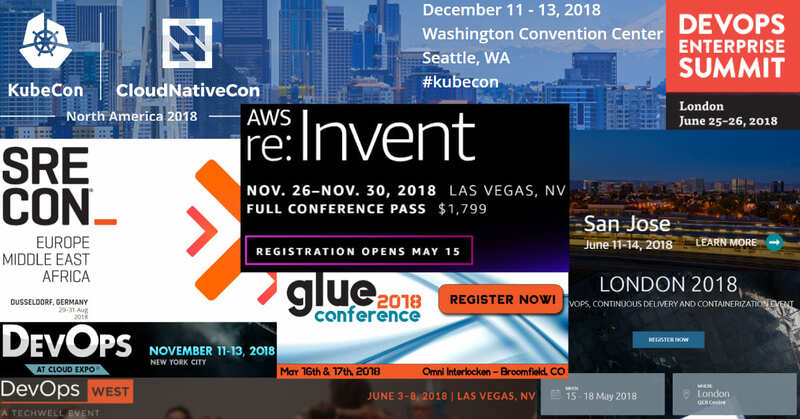 Amazon Web Services holds its annual AWS re:Invent 2018 event through November 26-30. These 4 days will be filled with hackathons, seminars, workshops and the Las Vegas Strip allure. More than 30,000 IT professionals and DevOps specialists will enjoy the firsthand experiences with the latest AWS tech that will be introduced to the public. We’ve covered the AWS re:Invent 2017 technology additions and will doubtless cover the new introductions in 2018. The KubeCon+CloudNativeCon paired event summarizes the advancements in Kubernetes and cloud technology throughout the year. It will take place in Seattle, WA, USA from 11 to 13 of December 2018. This event is mainly oriented at Cloud Native ecosystem users, but it will definitely interesting for anyone using Kubernetes in their daily DevOps operations, and this effectively means for any IT industry specialist nowadays. The best practices and latest advancements in Kubernetes applications, the real-life use cases and practical recommendations on improving the usage of this cornerstone infrastructure management tool — all of this will be packed in 3 short days. The keynote speakers will come from Google, GitHub, Heptio, RedHat and other industry giants, so don’t miss your chance to attend! We listed 10 upcoming DevOps events for 2018, so you will be able to plan ahead and create a most convenient and value-packed schedule for your business. 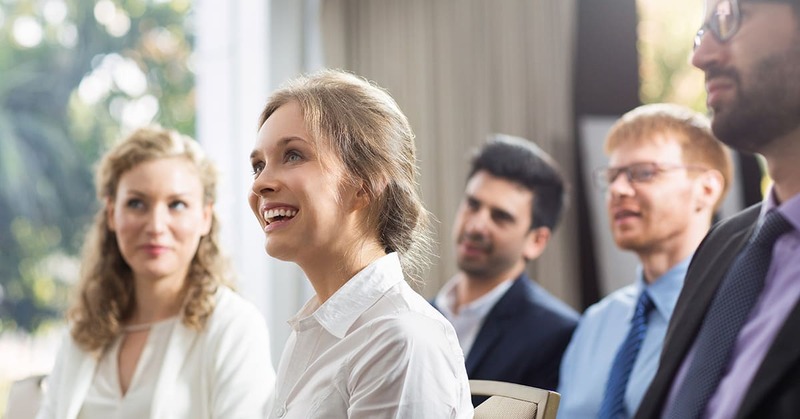 Leverage the best workshops and panels from the industry-leading experts to drive more value to your business, gain competitive advantage and provide top-notch service to your customers!